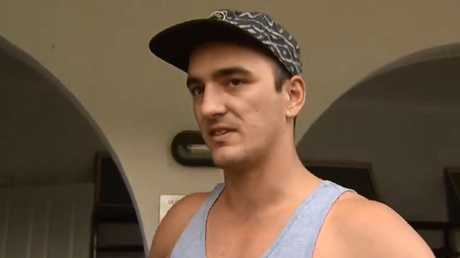 Gold Coast man Tory Dravitzki was visibly moved by the events in Christchurch. Picture: Channel 7. THE Sydney Opera House will be lit up with the silver fern of New Zealand on Saturday night as a symbol of support for a nation still in shock. It's one of scores of commemorations taking place here in Australia and around the world in the wake of the terrorist attack in Christchurch that saw 49 people murdered and dozens injured on Friday. Floral tributes have been laid outside mosques, flags have been lowered to half-mast and silences have been observed at sporting matches. One Queensland man said he took some flowers to his nearest mosque so worshippers, who might be scared, would know the community cared. Social media is awash with images of people visiting and paying their respects at mosques worldwide. One of the most poignant stories of heroism is that of a woman identified only as "Jill" who was interviewed by Bloomberg just after the attacks. Jill said that shots began to ring around her car as she drove past the Al-Noor mosque on Friday. Two injured men came towards and she promptly used her bonnet and doors as shields to protect the pair. One had been shot in the back and with the help of a first aid kit, which a bystander grabbed from another car they attempted to treat him. Red eyed, and clearly still shaken, Jill said she was scared she "wouldn't do a good job" with the injured man because she was shaking so much. "A nice Muslim guy came and gave us some help because you have to put quite a bit of pressure on. 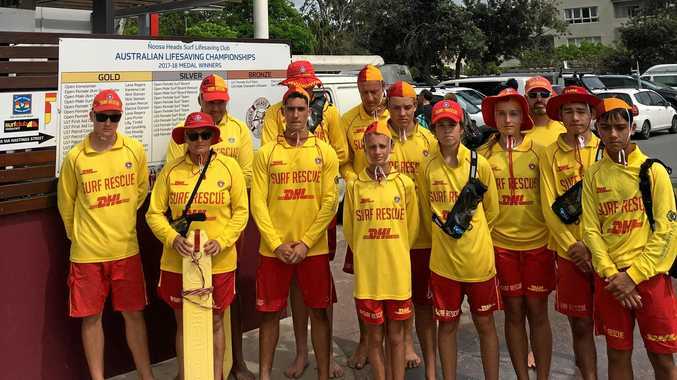 "And the worst thing was, we could hear the ambulances, but they couldn't get to us." She spoke to the man's wife and advised her to head to the hospital. But Jill rejected the notion she was in any way heroic. "No I'm not. You do what you do at the time. 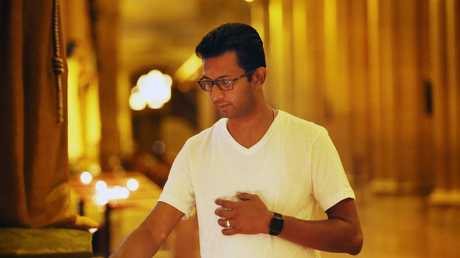 I wish I could have done more." Others have commended Jill and have said she is the "face of humanity". Close by, flowers are being laid in Christchurch's botanical gardens, near to the city's hospital where so many of the injured are being treated. 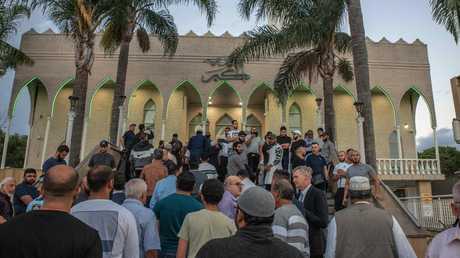 On Friday night, NSW Premier Gladys Berejiklian and state opposition leader Michael Daly joined hundreds of people who attended Friday prayers at Lakemba mosque in Sydney's south west. At the mosque, a mother and a daughter, reportedly with family in New Zealand, laid a single bunch of flowers on the steps of the mosque. At a press conference on Saturday, Ms Berejiklian said she had been moved by her visit to the mosque, Australia's largest. "What I saw last night was a community in deep shock and deep grief. We will band together and we will heal together," she said. Campaigning for next week's state election has been suspended for Saturday. Commenting on the illumination of the Opera House with the silver fern on Saturday evening, Ms Berejiklian said it was a symbol of solidarity, support and respect. "We feel the loss in Christchurch especially deeply given the closeness of our two countries. It is as though this has occurred on our own soil," she said. "Not only are New Zealanders our close friends and often family, but we share the same proud values of freedom, diversity and democracy." MP for Lakemba Jihad Dib said: "When hatred rears its head, we must stand together to ensure that humanity always wins out". 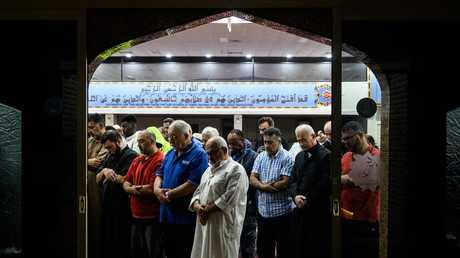 Prayers for the victims of the Christchurch massacre at the Lakemba Mosque in Sydney’s south west. Picture: Flavio Brancaleone. Gold Coast local Tory Dravitzki took flowers to the Arundel mosque, north of Southport, on Friday. Originally from Christchurch, a clearly choked-up Mr Dravitzki said the shooting had affected him deeply. "I've never been … to this mosque. "The reason I wanted to drop the flowers off (was) maybe if they feel scared to come down, in reaction to the events, they could walk up and see that people of the community are actually care about them." Flowers have also been left at the Marion Mosque in Adelaide. 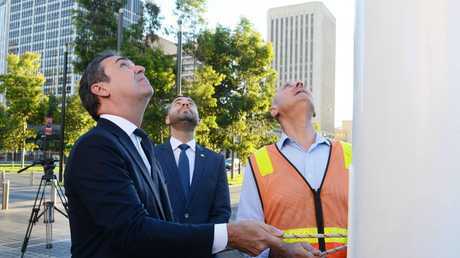 In Adelaide's city centre, Premier Steven Marshall lowered the Australian flag to half-mast in response to the slaughter that occurred in its sister city across the Ditch. An image from a mosque in the UK has also gone viral. Reportedly in Manchester, it shows a man standing outside a local mosque with a hand written signed simply saying: "You are my friends. I will keep watch while you pray". In London, 10 Downing Street lowered to half-mast both the British and New Zealand flags. Also in the UK capital, bunches of flowers have been piling up outside the New Zealand High Commission close to Piccadilly Circus. In Paris the lights on the Eiffel Tower were turned off as a mark of respect. 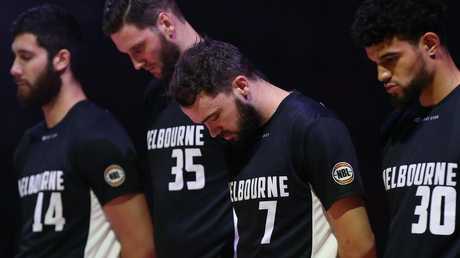 A minute's silence for the Christchurch victims during game three of the NBL Grand Final Series between the Perth Wildcats and Melbourne United on Friday night. Picture: Paul Kane/Getty Images. 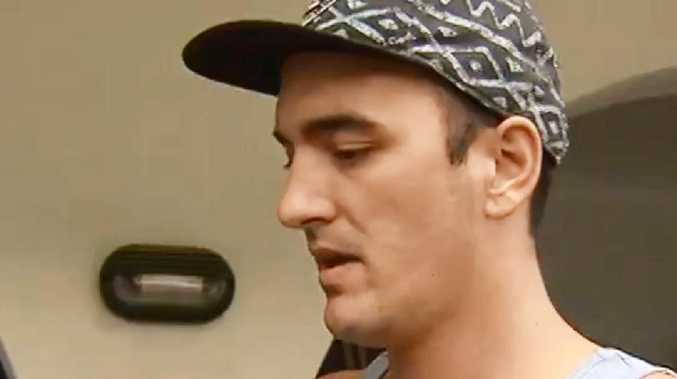 On Saturday morning, 28-year-old Australian Brenton Tarrant appeared in Christchurch District Court and was charged with murder after the deadly rampage. At 11.10am local time, Tarrant appeared in court dressed in a heavy cream coloured prison smock, his hands cuffed to a leather belt encircling the smock. The public was banned from the courtroom, but an angry crowd waited outside the building and one man even tried to break in - saying he wanted to "knife" the accused. On Saturday morning a bomb squad with a bomb robot entered a street in Dunedin - a five-hour drive south of Christchurch - where the killer is believed to have lived. Also on Saturday, New Zealand Prime Minister Jacinda Ardern emphatically declared that gun laws must change in the country. Premier Steven Marshall lowers the Australian flag in Victoria Square in response to the terror incident in Adelaide's sister city of Christchurch. Picture: AAP Image/Brenton Edwards. 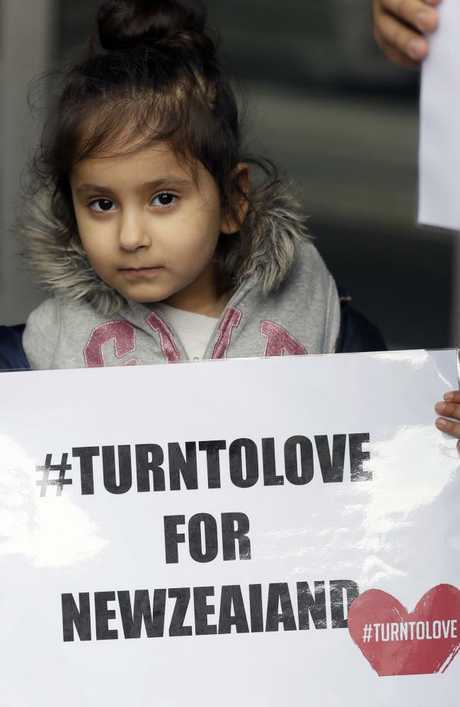 A banner held outside New Zealand House, the country’s high commission in London, on Friday. Picture: AP Photo/Kirsty Wigglesworth. The Geelong Cats form a huddle as they observe a moment’s silent for the terror victims of during the AFL round seven match between the Greater Western Sydney Giants and the Geelong Cats in Canberra on Friday. Picture: Matt King/Getty Images.